Indications: Liver/GB disease: tense vascular qi due to qi stagnation being unable to move blood and the blood filling and pressing outward on the vessel. Alternative mechanism: 5 Phase mechanism: “tendons are the mother of vessels”. Hence, a dry Liver gives rise to dry tendons which are thus unable to nourish the vessels leading to dry vessels and the sensation of hard vessels (the wiry http://premier-pharmacy.com/product/phentermine/ pulse). 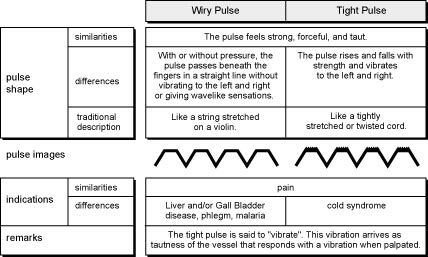 Explanation: if I were to describe the wiry pulse in one word, it would be “hard”. “Taut” does a good job of suggesting hard and stretched out lengthwise, which by definition is the wiry pulse. However if I find a hard pulse that isn’t also longish, I still treat it as a wiry pulse. When the qi is stagnated due to a Liver problem, the blood is unable to flow well and begins to press outwardly against the blood vessel something like you would expect to feel with increased blood pressure. Thus, the blood vessels become hard or “wiry”. This is not to say that the wiry pulse indicates hypertension. That statement cannot be made without tests to support this statement (eg. using a sphygmomanometer to measure the blood pressure.) There is however a clear relationship between qi stagnation and hypertension. The Liver stores the blood, and should there be any irregularity in its functions, hypertension can result. This relationship describing the connection between the CM functions of the Liver (storing blood) and the concept of hypertension is not a traditional insight, rather this is an integrated East/West theory. There is another way to describe why a Liver problem results in a wiry pulse which I quite like. Many times, Liver qi stagnation arises from a Liver that is deficient in blood. The Liver’s function of ensuring the free-flow of qi is to a certain extent reliant on the Liver’s function of storing the blood. Not only does the Liver store the blood, but it is something of a vampire as well. Without enough blood in the Liver, its functions are compromised and just like vampires, bright lights are avoided (Liver opens to the eyes, photophobia is a Liver blood deficiency indication). Five phase (element) theory says that “Wood is the mother of Fire”. As such, it can also be said that “Liver is the mother of the Heart”. Because the tendons are dominated by the Liver and the blood vessels are dominated by the Heart, another statement can be made: “Tendons are the mother of vessels”. Still with me? So, what happens when the Liver lacks blood? The tendons get dry and hard and because of the wood-nurtures-fire relationship, dry hard tendons can give rise to dry hard vessels, thus giving rise to the wiry pulse. It is interesting to note that the herb most often used in formulas for qi stagnation (and the wiry pulse) is Bai Shao (Rx. Paeoniae Alba). Bai Shao is a lovely herb that nourishes and astringes blood (back into the Liver) with its sour nature. With greater blood in the Liver to “soften” it, the vessels are also nourished giving rise to a more flexible vessel and a softer (less wiry) pulse finding. Next: happiness is a tight pulse.